This time while we were within the Cour Napoleon of the Musee du Louvre, in the 1st Arrondissement of Paris, we took these high definitions photos showing a statue of Puget by the artist Antoine Etex. 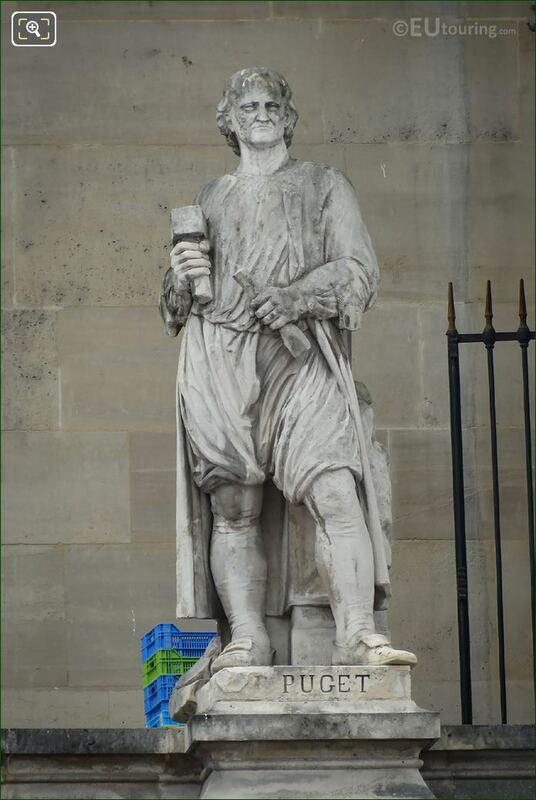 This first HD photo shows the full statue of Pierre Puget, which is located on the Aille Mollien wing of the Palais du Louvre, and it is positioned on the first level balustrade to the very far right hand side next to the Pavillon Mollien, as you are looking at the facade from the Cour Napoleon courtyard. 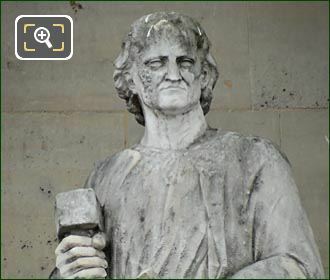 So this close up photograph shows some of the details that went into sculpting this stone statue of Puget, including a hammer and chisel in his hands, and this was produced by Antoine Etex, who was born in 1808 and became a French sculptor, with his best known works that earned him a great reputation, being the statue groups on the Arc de Triomphe known as Peace and War. 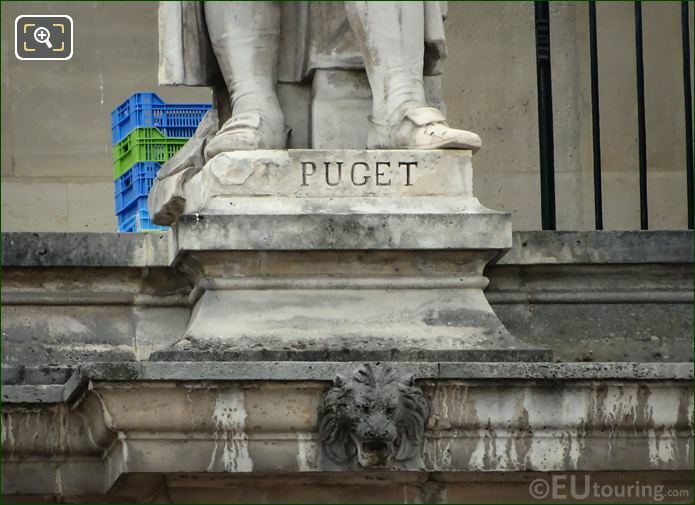 Yet this last close up image shows the name inscription on at the base of the statue dedicated to Pierre Puget, who was an architect, engineer, sculptor and painter, originally born in 1620 in Marselle, which is where he also passed away in 1694. 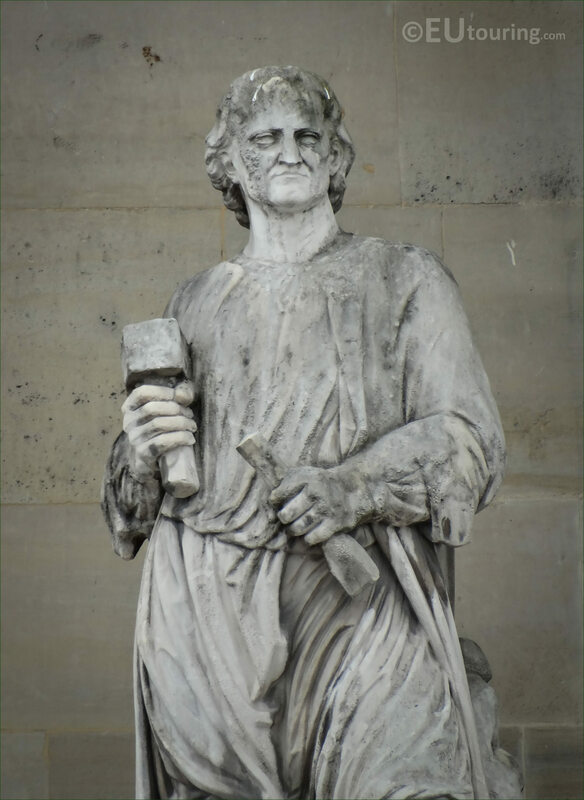 And incredibly at the age of 14 he was entrusted with carving the ornaments of ships galleys that were being constructed in his home city, and by 16 the entire construction and decoration was entrusted to him. But he then went to Italy and spent some considerable time in Rome producing numerous paintings and sculptures before his return to France, and many of his works can be found in numerous different museums including within the Musee du Louvre.